Simple to troubleshoot and easy to maintain, positive temperature coefficient (PTC) heaters have become the go-to heating solution for many compact applications. With a slim footprint, high efficiency, and fast thermal response times, PTC heaters are ideal for use in everything from underwater projects to electric vehicles. PTC heaters utilize thermistor technology to generate a rapid, high-power heat transfer in a small space. Depending on the specific heater design and environment, these devices can self-regulate for maximum efficiency in their surroundings. Crafted from sophisticated, high-performance semiconductor ceramic material, our PTC heaters are available in both fin and honeycomb models. Fin-style heaters’ heating elements are housed in rectangular aluminum tubes surrounded by PTC ceramic fins, while honeycomb-style heaters are constructed of extruded ceramic designed in round discs. Connected directly to the power source, a honeycomb PTC heater functions as the heating element of an overall assembly. 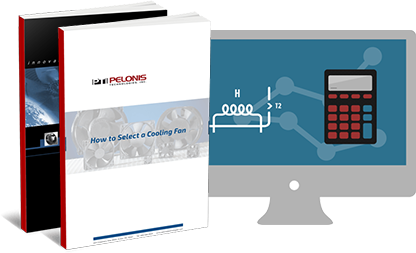 As a leading manufacturer of specialty heating solutions, the Pelonis Technologies team is proud to offer top-of-the-line PTC heaters. To learn more about our PTC products or discuss our full catalog of Pelonis heating solutions, reach out to the team today. Ceramic “Fin” PTC Heating elements create a good heat transfer in a small space and are safe, powerful, and energy efficient. Pelonis’ special patented heating disc is made from a revolutionary ceramic material with over 1,200 round/triangle shaped holes that heat 100% of the airflow across the entire surface area of the disc. This creates a superior heat transfer in a small space, which produces an instant flow of heat up to 50% hotter than conventional coil or ceramic chip heaters. Honeycomb PTC Air heating elements can be configured into three, four, or five disc configurations that produce up to 2000 watts of heat output. Standard sizes are up to 6 inches diameter. Other OEM configurations are possible depending on customer applications. All PTC holders consist of high temperature PPS plastic, stainless steel contacts and silver coating for optimum conductivity. PTC Heater assemblies can be configured with various size cooling fans and blowers to provide powerful, safe, and compact air heating systems that can be used in a variety of applications. Fin PTC Air Heaters have self-regulating characteristics and will not overheat.This results in better conductivity, greater operating efficiency, a stable electronic response, and longer life expectancy.